Often when poker players talk at the table, they reveal information about their hands. 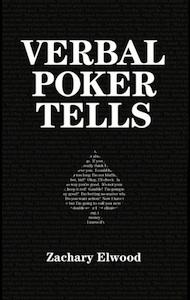 In a follow-up to the much-acclaimed Reading Poker Tells, Zachary Elwood describes the most common and reliable verbal patterns poker players tend to exhibit. He also provides a helpful framework for understanding verbal behavior at the table. To help illustrate various points related to verbal patterns and their significance, Elwood includes hundreds of hand examples culled from his own experience, hands he has witnessed or that have been supplied to him by others, and hands from televised poker including many that have been much-discussed by TV poker fans. The result is a highly informative and entertaining discussion of the subject, with many insights useful both to seasons players and to those brand new to live poker. For a review of Verbal Poker Tells, please visit learn.pokernews.com.